M. Rama Jois was born on 27th July 1931 in Araga village of Thirthahalli Taluk, Shimoga District, State of Karnataka. After securing B. Sc. and B.L. Degree from Mysore University he was enrolled as an Advocate of Karnataka High Court in 1959. He has been very successful in the legal profession particularly in the branch of Service and Constitutional Law. He authored the book" Services under the State" which was published by the Indian Law Institute in 1974 and re-published in 1987. He was appointed Judge of the Karnataka High Court in November 1977. His another book "Legal and Constitutional History of India" in two volumes which includes Ancient Indian Legal, Judicial and Constitutional Law (Vyavahara Dharma and Raja Dharma) has been subsidised by National Book Trust and published by N.M. Tripathi (P) Ltd, Bombay. The latest edition of the book has been published by Universal Law Publishing Co. Pvt. Ltd. This book has been described as a monumental work by eminent scholars and Judges in their review of the book. It has been recommended for study for the law degree course by the Bar Council of India. In May 1992, he became the Chief Justice of Punjab and Haryana High Court, which post he held till his retirement. After retirement, he resumed practice as Senior Advocate in the Supreme Court and has argued in matters of National importance. He has been the Honorary Professor in National Law School of India University, Bangalore. He was awarded Naresh Chandra Sen Gupta Gold Medal by Asiatic Society, Calcutta for outstanding contribution to the study of Society and Law, Ancient and Modern, in May 1999. He has been the Vice- President of Bharatiya Vidya Bhavan, Bangalore Kendra, since 1994 and President, Bharat Vikas Parishad since 1999. His article entitled "Need for Amending the Constitution" has been published in the commemorative volume of the Golden Jubilee of Lok Sabha in May 2002. It gives me great joy to write this brief foreword to the book, "Raja Dharma with Lessons on Raja Neeti", written with much devotion and care by the well-known jurist Justice Dr. M. Rama Jois. Going through the book I find it as a votive offering to the Goddess of Dharma and for this reason it affords me special happiness to write this foreword. It is rare to see a book plumbing to such depths never seen before in analyzing dharma and its relevance to the present day world caught as it is in a vortex of violence and untruth. Rajneeti comes as a whiff of fresh air and thanks to Shri Rama Jois the subject of dharma, despite being too vast in its myriad connotations, has been presented with such candor and simplicity for all of us to get a glimpse of it. Shanthi Parva admits the difficulty in describing dharma which more often than not is loosely understood albeit not without a little confusion The parva defines dharma as: Most difficult to define. Dharma has been explained to be that which helps the upliftment of living beings Therefore, that which ensures the welfare of living beings is surely dharma. The learned rishis have declared that which sustains is dharma. Paraphrasing we get a sense of dharma as being scrupulous: adherence to the Rule of Law - moral and secular - and, therefore its practice leads to peaceful co-existence. Implicit in dharma are a wide range of values: patriotism, social obligations, equality, gratitude, compassion, service and sacrifice. And the corollary to dharma of course is adharma as explained in Manusmriti. 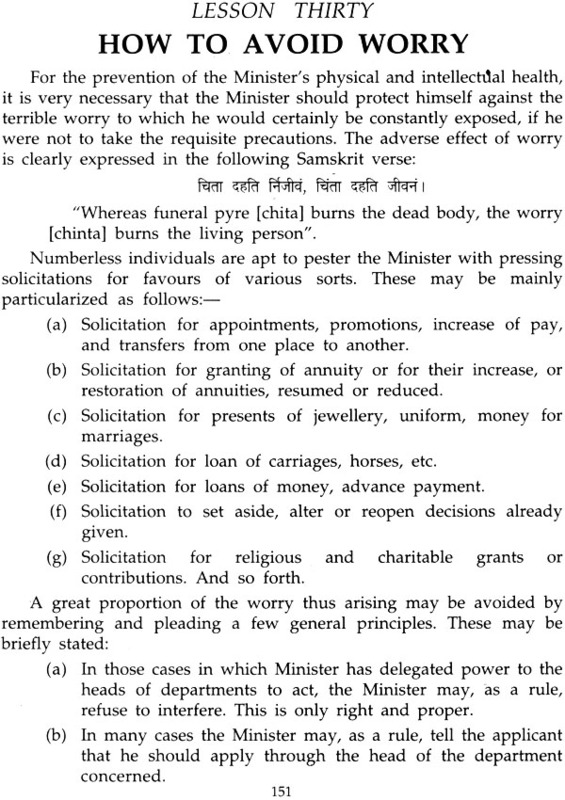 The smriti warns against indulgence in adharma by pointing out that one certainly does attain immediate success and secures fulfilment of desires. Yet the consequence of adharma should never be in doubt as if has the power to overpower the practitioners who ultimately ruin themselves. This is a certainty, it says. The necessity of scrupulous practice of dharma is forcefully expressed by Manu himself: dharma protects those who protect it. Those who destroy dharma get destroyed. Therefore, dharma should not be destroyed so that we may not be destroyed as a consequence thereof. Well, what is Bharatiya philosophy of life anyway? It is the sum and substance of dharma, artha and kama. In other words one's desires (Kama) for material enjoyment and pleasures (artha) must dovetail and conform to the code of dharma or Code of Right Conduct. It applies to all human mortals be it high or low. 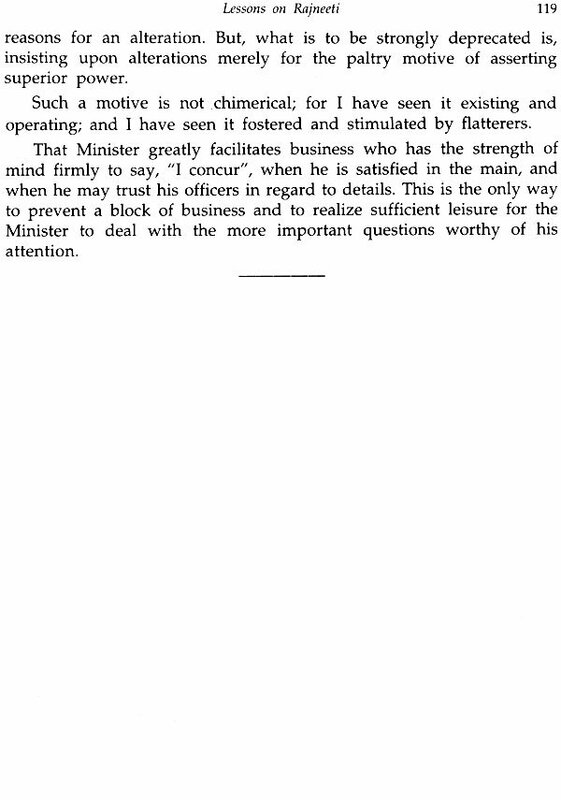 An interesting aspect is the Part II of the book dealing with the teachings of the great administrator Raja Sir T Madhava Rao on treating high officers, which I may say pertains more aptly to the political Class who rule today. How relevant are the views of Madhava Rao, who was a diwan of Maharaja Sayaji Rao III, Gaekwad of Baroda (1881 to 1939), expressed 130 years ago today? This great administrator had taught the Maharaja how to excel in the art of administration without compromising on dharma. Jurist Rama Jois has brought out the teachings of Madhava Rao nicely in his book which gives us an insight to avoid falling into the pitfalls while administering a state. The jurist rightly points out the drastic fall in professional ethics in all spheres today. At this juncture, the teachings of Madhava Rao become highly relevant not only to the individual but also in the context of administration and statecraft. On team work and fair' play Madhava Rao says: 'Assuming high officers have been carefully selected for their capacity' and probity, the minister should treat them with confidence. 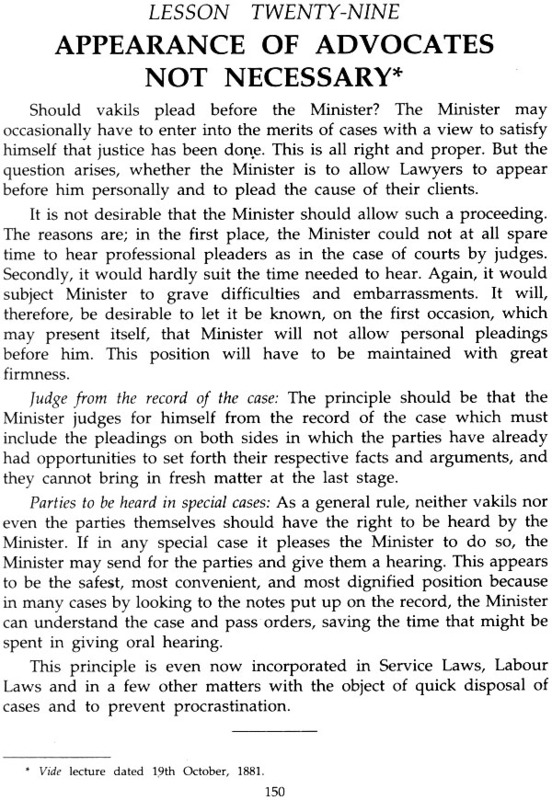 It would be unjust to suspect them of a disposition to misrepresent matters to the minister. The minister who has not learnt how to repose confidence in others, will be able to accomplish but little in his career because he will not secure cordial cooperation. The self-respect of the high officers should be preserved and strengthened by the minister treating them with courtesy and consideration.' Therefore his teachings have the potential to solve any critical problem faced by Governments as well as the Corporate World. I would be indeed happy if the political class spares a little thought and time in going through this wonderful book and learns a lesson or two. I congratulate Justice Rama Jois in this excellent endeavor that is well researched and timely. 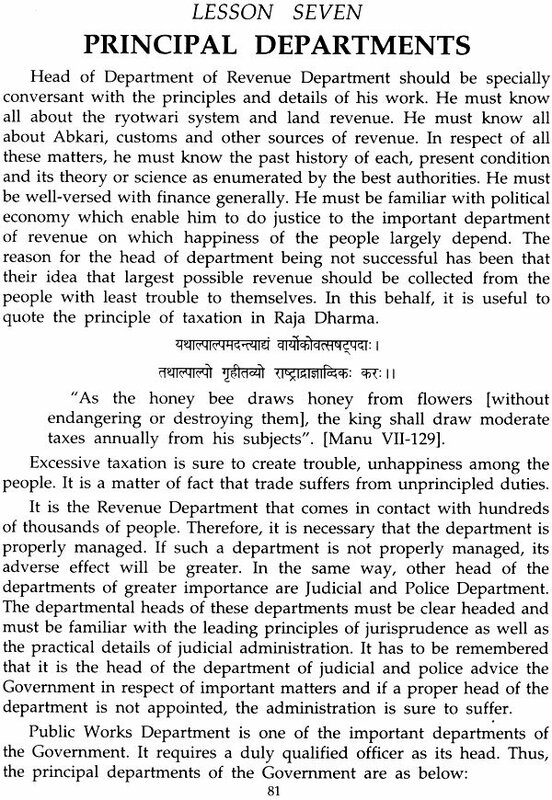 It is a matter of pride for us that the propounders of Raja Dharma - the constitutional law of ancient Bharat declared that the King [State] was absolutely necessary to maintain the society in a state of Dharma which was essential for the fulfilment of the requirement of Artha [wealth] and Kama namely the desires and aspiration of the people. Raja Dharma, which laid down the Dharma of the King, was declared as paramount. Politically the whole of India never came under the rule of anyone emperor or a king. The territorial extent of a kingdom depended on the prowess and capability of each king. Therefore, innumerable kings ruled over different parts of the sub-continent, each of whom was independent of the others, except in cases where one became a vassal of an emperor. At the same time, as a society, the entire Indian population constituted itself into one homogeneous unit. Political divisions of the country coming under the control of different kings did not result in the division of society into separate nations. "It is an interesting fact of history that India was forged into a nation neither on account of common language nor on account of the continued existence of a single political regime over its territories but on account of a common culture evolved over the centuries. It is cultural unity - something more fundamental and enduring than any other bond which may unite the people of a country together - which has welded this country into a nation" [Pradeep Jain's case, AIR 1984 SC 1420 - para 2]. It is a matter of great distinction that notwithstanding the fact that there were innumerable states under different kings, all of them were governed by the same law on all matters including Raja Dharma which is equivalent to the present Constitutional law. In view of this, the same system of Government came into existence in all parts of Bharat. The system of Government was well established for over fifty centuries as evidenced by the two great epics namely the Ramayana and the Mahabharata and the history of Bharat for the last five thousand years. 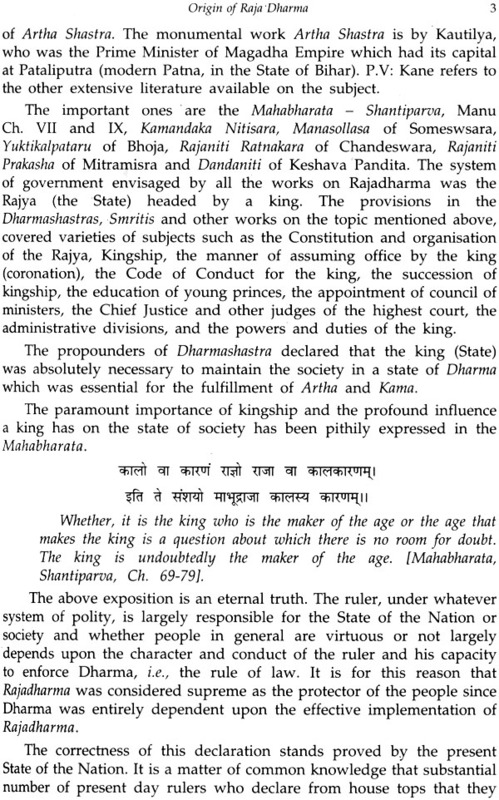 While the head of the State was designated as Raja [King], the King was bound to rule the State concerned according to Rajadharma only and on the advice of the council of ministers. The clear concept of having council of ministers to enable the King to administer the State in an efficient manner was recognized from most ancient times. Notwithstanding the fact that in the meandering course of the history, substantial parts of the Country came to be ruled by Moghuls and subsequently by Britishers, the fact remained that there were innumerable States which were ruled by Bharateeya Kings. In all those States, substantially the same pattern of Government as envisaged by Rajadharma headed by the King and aided and advised by the council of ministers existed. This position continued till 15th August, 1947 when India became independent and the States merged in Union of India and independent Constitution came into force with effect from 26th January, 1950. Every King who was the head of the State concerned, used to have council of ministers, head of whom was designated as 'Diwan'. It is a matter of satisfaction that by and large, the Diwan and the council of ministers in the Princely State had carried on the administration in an excellent manner. Illustrious names of Diwans in different States were Sir M. Vishveshwaraiah, Sir. Mirza Ismail, Diwan Seshadri, Diwan Madhava Rao, Diwan Rangacharlu, Diwan Arcot Ramaswami Mudaliar, Sir c.P. Ramaswamy Iyer and others. The law (Dharma) is the king of kings. No one is superior to the law (Dharma); The law (Dharma) aided by the power of the king enables the weak to prevail over the strong. "Dharmam Kshatrasya Kshatram" "Dharma, righteousness is the king of kings. It is the ruler of both the people and the rulers themselves. It is the sovereignty of the law we have asserted. Thus, emperor or kings were subordinate to Rule of Law. 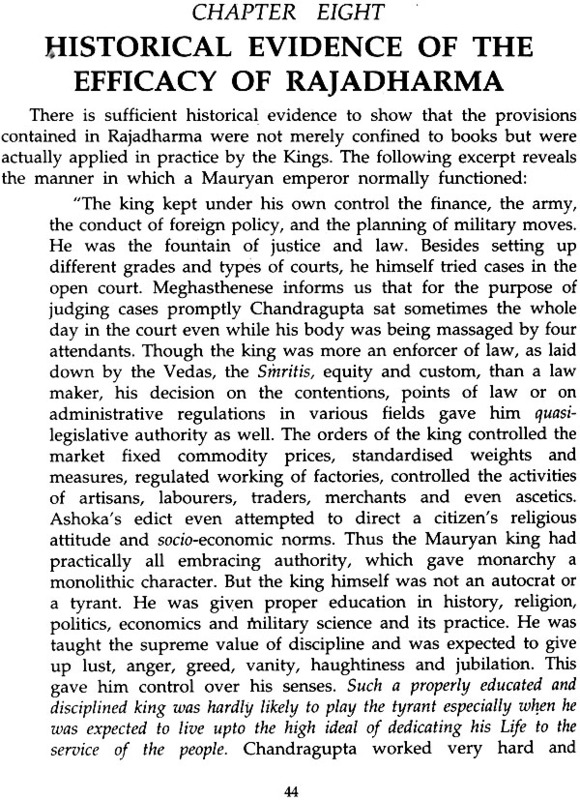 The western doctrine that 'king can do no wrong' was never accepted under Rajadharma. Thus, we have adopted the principle that 'Constitution of India' is supreme and neither Parliament, nor judiciary nor executive. 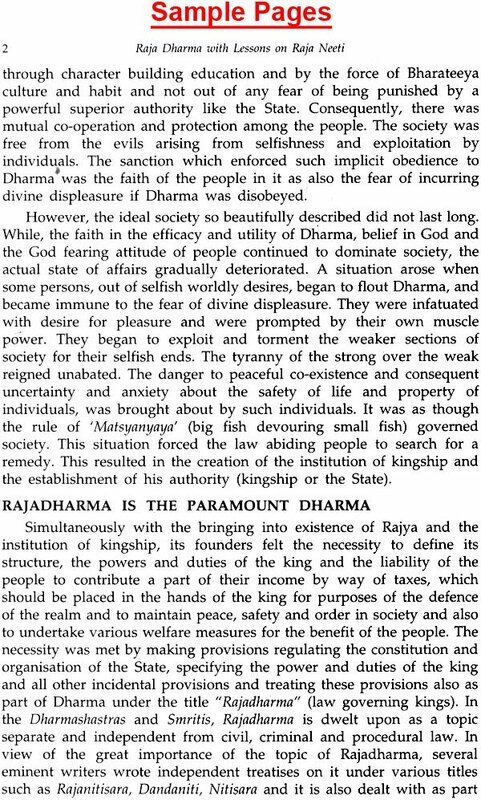 Thus, 'Dharma' including 'Raja Dharma' was regarded as supreme and the King was only penultimate authority, 'Dharma' being the ultimate authority. Thus, from the commencement of the Constitution, its supremacy constituted an element of basic structure of the Constitution whose principle was reiterated by 13 judges Bench of the Supreme Court in the historic case of Keshavananda Bharati [AIR 1973 SC 1461]. As a result, though States were many under different Kings, 'Raja Dharma' or 'Constitutional 'Law' uniformly applied to all of them and regulated the Constitution and Organisation of all the Kingdoms as also civil and criminal law including procedural law. Work of the entire- Government was divided into various departments and the designation of each of the departments was also specified. The administrative division made in Kautilya's Artha Shastra around 300 BC is really inspiring. According to Kautilya, while the prince was eligible to become a King and get coronated after taking the prescribed oath that the Prince was to be properly educated in all branches of knowledge and in particular relating to Administration to become suitable to be a King. This directive was scrupulously followed in all the States and great importance was given to the Princes who were to be coronated as Kings on hereditary principle and right to primogeniture. Now we have democratic system under which any common man who is a voter can become a ruler as Prime Minister or Chief Minister or as Minister. 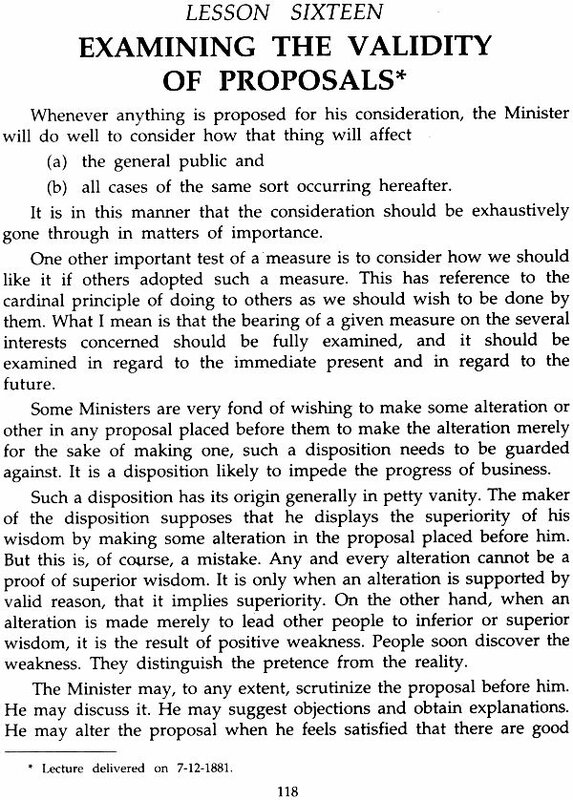 Therefore, it is all the more necessary that those' who aspire to become rulers, must undergo training instead of becoming upstarts without experience and training. It is high time that institution imparting training in polity and art of administration should be set up with the object of producing required number of competent political rulers. 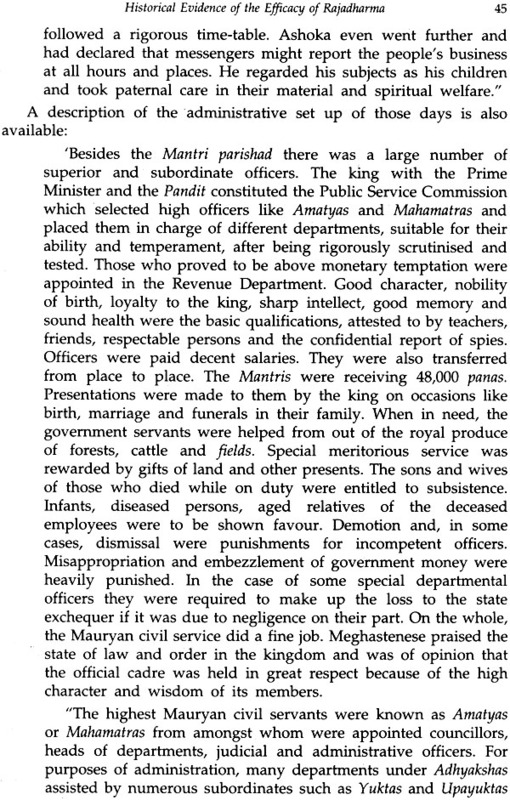 The same system established under Rajadharma was continued in Princely States during British rule. Applying the directive given in Kautilya's Artha Shastra, Princes becoming Kings were being educated and trained to equip them to carryon the administration. This is evident by the detailed instructions given to Maharaja Sayaji rao Gaekwad-III of Baroda by Diwan Sir T. Madhava Rao on various topics which are of eternal value. All the lectures given by him, have been compiled and published in the form of a book entitled "MINOR HINTS" copy of this book was presented to me by Sree Narendra Modi Ideal and eminent Chief Minister of State of Gujarat, within whose territory erstwhile Baroda falls. 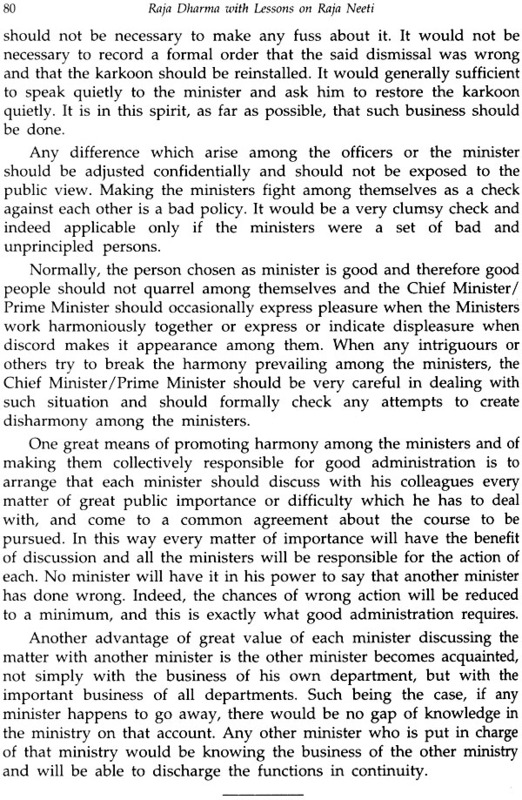 On going through the lecture, I considered it appropriate to reproduce them in the form of this book as they are extremely useful for the ministers and the heads of the departments in carrying on the administration of the State under the democratic system established under the Constitution of India but also useful to those who desire to equip themselves in the art of administration. In Part-I of this book, essential aspects of Rajadharma are incorporated in eight chapters and in Part- IT, 38 lessons on Rajadharma as expounded in the lectures of Sir T. Madhava Rao to the ruler of Baroda delivered during 1881 on various dates which are of eternal value and therefore worthy of being followed by Ministers and Administrators under the present Democratic system of Government established under the Constitution are given.